Goffin's Cockatoo (Cacatua goffini) populations are suspected to be declining at a moderately rapid rate due to trapping and habitat degradation. Project progress: WPT rescued hundreds of Goffin's Cockatoos caught in the wild-bird trade on Tanimbar. Outcomes: In 1993 the World Parrot Trust helped secure the release of about 700 Goffin’s Cockatoos from trappers. A television crew had been filming on the Indonesian island of Tanimbar and reported to WPT that the trappers were holding the birds in cages. The species had just been added to the CITES Appendix l list of threatened species. The Trust used its contacts in the area to make a payment to the trappers for the release of the birds back into a suitable area of forest. Purchasing from trappers is not a usual way of practicing conservation, however it was done to immediately save this group of birds. The cockatoos were checked for disease and most of them released back into the wild. Where found: The Goffin’s Cockatoo (Cacatua goffini) is endemic to Yamdena and Larat, Tanimbar Islands, Indonesia. This cockatoo favours coastal lowland primary and secondary forest and cultivated areas. 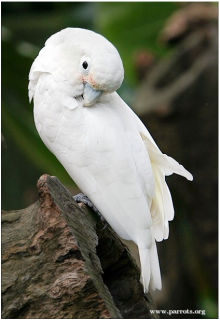 History: Cacatua goffini, or Goffin’s Cockatoo, is found on the Banda Sea Islands of Yamdena and Larat (Tanimbar) with an introduced population on Kai, Indonesia. In the 1980s there were concerns for the stability of the population because of the large numbers, 10,000 birds in some years, that were entering the trade. Ecology: The ecology (behaviour and diet) of the Goffin's Cockatoo is little known. Breeding season is not known, although it is confirmed that two to three eggs are laid. Birds are usually seen singly and in pairs. At dusk they gather at communal roosts to rest.